Introducing the newest way to Display Diecast Clamshell Blister Pack Cards. The secure and flexible way to display your hanging collectibles. Collectible Hangers— the newest way to Display Diecast Clamshell Blister Pack Cards. As you read through the website, you will see how Collectible Hangers can be used with various hanging package sizes and types. 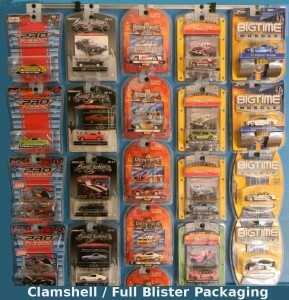 Especially “Clamshell/Full B lister” die-cast packaging (shown here). For further information on packaging types see the Package “lingo” page. Display Diecast Clamshell Blister Pack Cards have never been able to be in the same display case as uniquely as this. See our Introduction here…Collectible Hangers. We are the Display Diecast Clamshell Blister Pack Cards for Hanging Collectibles innovator. 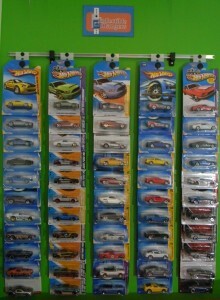 Most other die-cast vehicle displays only allow for one unique type of packaging to be placed in the display for mounting and/or hanging on the wall. Collectible Hangers has the flexibility to allow your imagination to decide how and what you would like to display together. There are endless possible layout designs. Today’s cards come in multiple sizes and the cars are inside the plastic shell (or ‘Blister’) on the card which also vary in size. In other words, the cards are the same size, but the plastic shell holding the car on the card is not always uniform in shape or size, and most importantly is the height. (We talk further about this on the website an d give more examples. see more shapes and sizes). See more on our “Quick Look” page. Or take a look at more Packaging Examples. And have a look at more Display Examples.